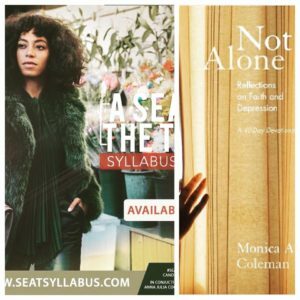 Honored to see that my book NOT ALONE: REFLECTIONS ON FAITH AND DEPRESSION is mentioned in #SeatSyllabus from women of color under age 30. Based on the “Seat the Table” album by Solange, Seat Syllabus is curated by Candice Benbow, Elle Magazine and Melissa Harris-Perry and the Anna Julia Cooper Center at Wake Forest University . Thank you all and Solange for putting self love and self care to the forefront!